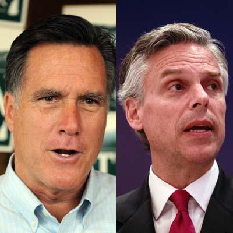 I ran across some encouraging news today: presidential candidate Mitt Romney and likely presidential candidate Jon Huntsman both accept the science on global warming! Of course, this means that they stand even less of a chance of making it through a GOP primary vote which pretty much insists its candidates pass through a purity test involving gems such as denying evolution, global warming, and gravity. Still, I didn’t figure either one would make it that far anyway, and my Mo-pride is glowing a little brighter today. If 90 percent of the oncological community said something was causing cancer we’d listen to them… I respect science and the professionals behind the science so I tend to think it’s better left to the science community–though we can debate what that means for the energy and transportation sectors. That succinctly echos my exact sentiment on the role science should play in public policy. Most politicians don’t seem to grasp science too well (probably a fair reflection of the people electing them) and only pick and choose those bits that help them further their agenda. This unholy mix and misuse of science and politics often leads people to view the science skeptically.